I stamped this hilarious Art Impressions image over at my friend Mary Anne's house quite a while ago, along with one of her unknown hysterically funny sentiments that just "belongs" with this image! I watercolored the background with pastel reinkers and water, then embossed it with a SU! ef. The diagonal strips are washi tape, and the tiny flowers were done with a SU! mini punch, adding gemstones to the centers. The combination of those bunny slippers and the smiley face coffee cup just cracked me up! 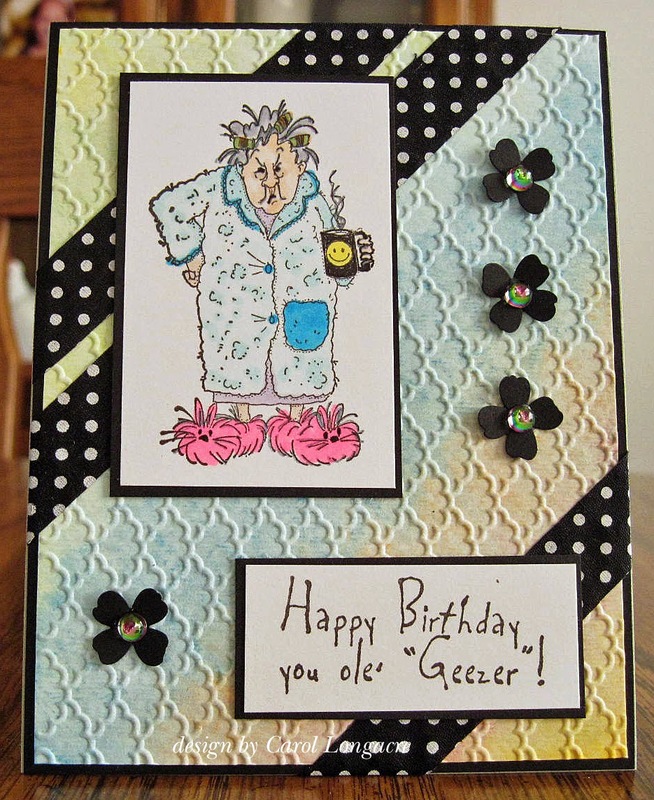 I'm entering this card into the Crafty Gals Corner challenge #13 which is "humor, comedy, funny." I'm also going to slip this into the Snippets Playground #170 before the gates close! Thanks for stopping by today - make it a great Friday! Put some Ginger Ale in that cup and this could be me. LOL Oh gosh I hope not. Anyway this card IS hilarious. Fantastic background paper you created and that Washi tape and flowers both go nicely together. You know me, I love to see something black on a card even if it is just matting. Love the sentiment. Mary Anne has some good stuff at her house and you have some great ideas to go with her stuff. YAY for the rest of us. Our snow is slowly disappearing and by Sunday it might be all gone in time for the nest storm. Enjoy your day. This is a favorite image of mine! Always puts a smile on my face. Great job with this card! This card is too hilarious, Carol! Love the fun image, and the background is very beautiful! Those Art Impressions Oldsters are so funny. Love this image and it makes for a great b-day card. Great card design too. Go washi! I can relate to this! LOL! Reminds me of what I see when I look in the mirror in the mornings but I DO need some pink slippers like that! Cute card Carol and love the embossing on here. Ha.....what a fun card, Carol. I think she needs to take a look at the face on her cup and follow along, don't you? A fabulous fun card , I love the background you made, the pastel colours look great with the black accents. Well your all dressed ready for bed so I think I will come on over to the playhouse and join you with a hot mug of something. The day I have had I think I will bring some of the doc's whisky with me. Love the shaded background. Our dressing gowns used to be in that pttern as kids. Happy days. hugs Mrs a.
hahaha! LOVE it! The pink slippers just MAKE that image!